Charleston, Sc beaches, we have so many here, including Isle Of Palms, Sullivan Island, Kiawah, Folley Beach, we are so blessed here in Charleston,Sc, that we can be free to go to any of those amazing beaches. When it comes to engagement session on the beaches here in Charleston Sc, One of my favorite place to capture my clients engagement is Folly Beach. 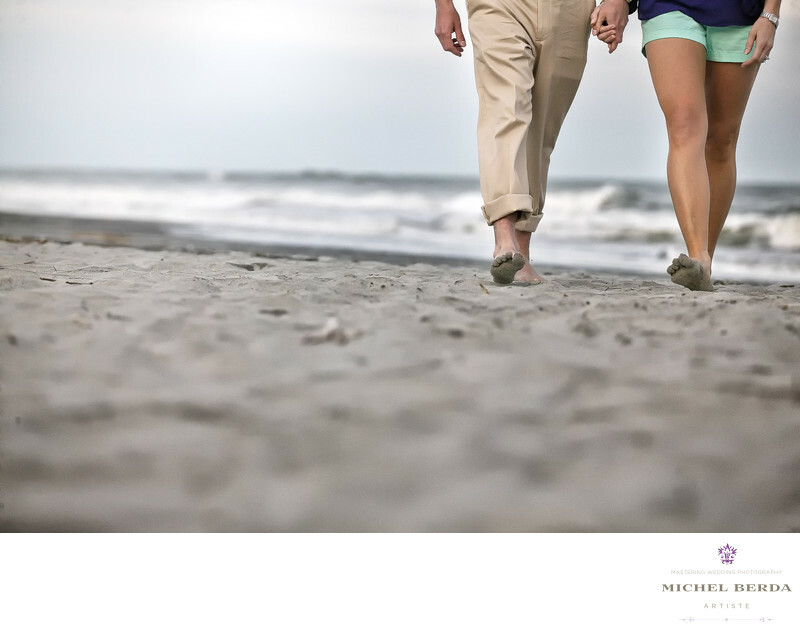 For this engagement session my clients parents owned a home right on Folly beach, which gave us easy access to walk right onto the beach. I am always looking to improve my photography with my cameras, by having various different lenses, and having in my mind what I want to capture. The beauty of that is I can always be ready for any moment or for what my eyes see, and knowing the equipment very well at moments notice I can take a photo. As for this image, they were walking behind me, I looked behind me and saw what I wanted to photograph so I decided to lay down flat on my chest and capture their feet walking on the beach. A perfect beach engagement theme.